What's wrong with good old-fashioned dividends? These days, apparently nothing at all. So, it's not surprising that dividend-rich master limited partnerships are starting to look rather appealing to investors. An MLP is a limited partnership that's traded on a stock exchange like a stock of any company. It combines the benefits of limited partnerships with the liquidity of publicly traded securities. They're limited by the U.S. tax code only to enterprises in certain businesses, mostly pertaining to the use of natural resources such as a petroleum, natural-gas extraction, transportation (pipelines) and, occasionally, real estate. Roughly 70 MLPs are based in the U.S. According to Morningstar, some are structured as exchange-traded notes, closed-end funds and open-end funds. At the end of August, the first MLP exchange-traded fund was launched, Alerian MLP ETF (AMLP). Why the buzz about MLPs? Tax-favored dividends. MLPs can be generous because they don't have to pay federal income taxes if they pay out most of their cash flow to shareholders. Many MLPs are now annually paying in the 6% to 10% range. "Since much of the distributions is typically considered a return of principal, that part is not taxable," explains Frank Beck, managing partner and chief investment manager for Capital Financial Group. Many investors will also realize the benefit of sharing in the depreciation of the MLP's assets, Beck says. For example, a pipeline that transports oil or gas has a high initial cost and depreciates over a number of years. MLPs can offer a long-term investor an attractive stream of income with some additional appreciation. And because MLPs usually own hard assets, they also offer an attractive hedge against inflation, adds Beck. Coal MLPs: 12-month average return 76%; year-to-date average return 29% (through Sept. 9); average distribution yield 6.9%. Exporation & Production MLPs: 12-month average return 70%; YTD average return 30%; yield 8.7%. Pipeline MLPs: 12-month average return 39%; YTD average return 18%; yield 6.6%. Propane MLPs: 12-month average return 35%; YTD average return 15%; yield 7.3%. Pamela Roseau, a managing director with HighTower believes MLPs are an emerging asset class, the same way real estate investment trusts (REITs) were 20 years ago. She calls them a hybrid between debt and equity, and thinks they're a valuable "total return" vehicle. She also says MLPs are an excellent way to diversify a portfolio because their movements are minimally correlated to those of other asset classes, such as stocks and bonds. One reason she's big on MLPs is their visible, steady cash flow. MLP revenues are fueled by the steady demand for products such as gasoline or natural gas, she says. Many MLPs lock in long-term contracts of 10 years or more with their customers. And many also have annual tariff-adjustment mechanisms built in so that when costs rise, they can pass them on to customers. Additionally, because these MLPs have long histories of increasing their distributions, in most cases income growth should outpace inflation, she says. MLPs aren't new. Congress authorized them in the mid-1980s, but they have new appeal. "Investors are discouraged. They've virtually given up on equities and real estate, and pushed MLPs, commodities and fixed income," says Alan Lancz, director of research at LanczGlobal.com. "The MLPs that we liked 10 years ago are now favored because of their strong income streams and average 11% return over the least decade. Unfortunately, once again, investors are piling in without understanding the risk in most MLPs," says Lancz. Just how do MLPs work -- and what are the risks? In an MLP, a general partner runs the business, while individual investors are limited partners who own units instead of shares. Originally, at least for pipeline operators, an existing oil or gas producer would form an MLP, set itself up as the general partner and then from time to time transfer portions of its pipeline assets to the partnership. Although that still happens, nowadays the general partner could also be in an unrelated business, says Harry Domash, publisher of the Dividend Detective, which focuses on providing information and education on a variety of dividend-paying investments, including stocks, bonds, REITs and MLPs. The general partner receives a percentage of the MLP's profits off the top, before the limited partners receive their cut. 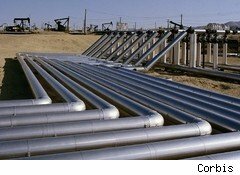 Domash says over the long term, MLPs are relatively stable investments, especially pipeline operators. "While a particular winter could be too warm or the summer too cool, reducing transported volumes, pipelines don't go out of fashion. They're not in danger of being made obsolete by new products, and since they usually don't duplicate each others' routes, pipelines don't have competition," he adds. Furthermore, the demand for natural gas is likely to increase, creating the need for more pipelines. However, there is commodity price risk. While fees for operators of crude oil and refined petroleum pipelines are based on the volume of product transported and aren't affected much by the price of the commodity transported, natural-gas pipeline operators' profit margins can vary with gas's price. "Many employ hedging strategies to reduce their susceptibility to price swings. But not all do because that limits their upside potential," says Domash. How does Uncle Sam figure into the equation? Simply put: "You need to understand the treatment of distributions," says Lancz. Due to the partnership structure, MLPs generally avoid corporate income taxes. Roughly 75% to 80% of distributions are considered return of investment (return of capital) instead of income. The balance is return on capital. You don't pay taxes on the return-of-capital part until you sell. However, when you do sell, you pay taxes -- mostly at ordinary rates -- on the portions previously designated as return of capital, says Domash. The return-on-capital portion is taxed at ordinary rates. Further, if you receive return-on-capital distributions totaling (from all MLPs) more than $1,000 in a year, the amount exceeding that figure may be considered unrelated business income and subject to taxes. This can create an unexpected tax liability for MLPs held in a tax-deferred account, such as an IRA, which is why Lancz says such accounts aren't a good idea for MLPs. Lancz also worries that tax laws governing MLPs could change to eliminate their significant tax-deferral advantages. MLPs issue K-1 tax forms instead of 1099s, and the tax returns can be more complicated, says Domash. Because K-1s are typically delivered in early spring each year, some investors may have to file an extension on their tax returns. Dealing with K-1s in an IRA or Roth (qualified) accounts is more work than most investors would want to do and would require significant CPA charges, says Beck. Investors using qualified accounts or short-form tax returns should use ETFs consisting of MLPs, advises Beck, or they may wish to use a general partnership, which doesn't produce K-1s. However, the ETFs and GPs typically pay several percent less than individual MLPs. For whom might these complications be worthwhile? MLPs are ideally suited for the investor who's looking for attractive yields and is willing to accept some volatility in the underlying asset, says Beck. The investor should have a time horizon of at least three to five years. Since cash flow is seldom impeded by any significant percentage, MLPs are easy to hold through tough markets by investors who understand them and are looking for cash flow. "During the 2008 financial crisis, very few MLPs suspended distributions, and most did not even decrease their quarterly distributions," says Beck. Of course, MLPs have their detractors. Rich Arzaga, founder of Cornerstone Wealth Management, is among those not overly impressed. "MLPs are a relatively new investment vehicle. New investment vehicles tend to pique the interest of early adopters. This doesn't mean that MLPs are a good idea. MLPs aren't for everyone. In fact, they're not for most investors." Arzaga makes another point that applies to all investment types, not just MLPs: "More important than bragging rights at the country club is answering the question of suitability: Is the investment strategy and vehicle appropriate or suitable for you, based on your goals and financial situation."